There are several species of squirrels in Indiana. Some squirrels may even be a mix. There are common tree squirrels, thirteen stripped squirrels, fox squirrels, gray squirrels and even some flying squirrels in southern Indiana. Squirrels generally pair up with a mate for life. Once paired up, it may not be long before there are baby squirrels. Mature female squirrels may have young more than once a year. Babies may be born in the spring, fall or both. 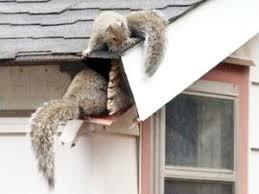 Squirrels often will invade an attic or climb down into a chimney. Squirrels can very be destructive little animals. Squirrels chew wood, duct work and even electrical wires. Squirrels are a major cause of home electrical fires.